The Hungry Southerner crew are all huge fans of AMC’s drama Mad Men. There is something mysterious, fascinating and classic about the style and period of the men and women of the advertising agencies of the late 50’s and 60’s. Because we’re so crazy about Mad Men, we’re throwing a Mad Men season premier party, and we’re giving you a peek at part of the menu; period clothing required. 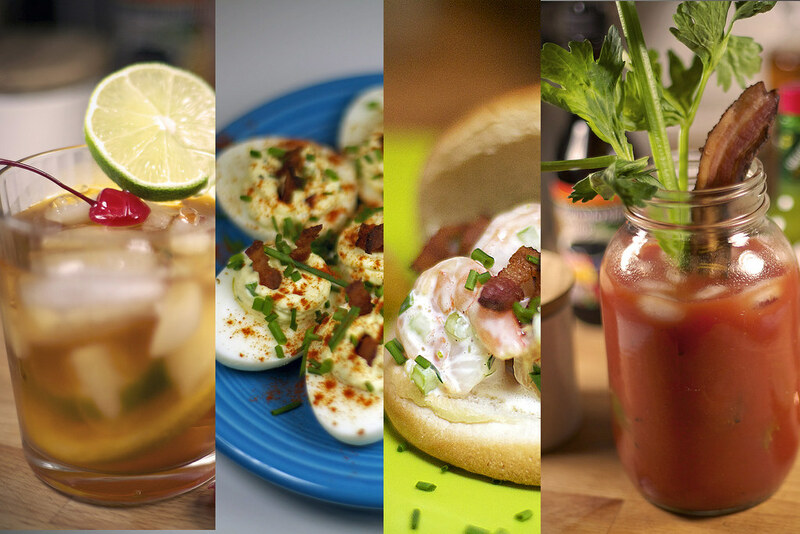 Classic dishes and drinks, for a classic period in American History, what better way to celebrate than with some great Southern food and flavors. We’ve selected 2 timeless dishes and 2 authentic period drinks for our party. Deviled eggs are classic southern party food, and we are giving you our secret recipe all done up, it’s not your grandmother’s deviled egg. To give the grill a day off, we’ve settle on serving a great shrimp salad, with really bright flavors so it doesn’t sit too heavy plus it can be eaten with fork or on a roll. To wash it all down we’re making two Southern classic drinks; our own Breakfast Bloody Mary and a high dollar Old Fashioned to get our Bourbon fix. Be sure to add your party menu below, or tell us who your favorite Mad Men character is. Got a favorite episode? Let us know why it’s your favorite. Smoke’em if you’ve got’em! Carefully divide each egg and remove the yolks. Whisk together yolks, and remaining ingredients minus bacon, paprika and chives. After ingredients are well whisked, carefully fold 1/4 cup chives and move to a 1 gallon zip lock bag with one corner snipped. Carefully pipe filling into each egg half. 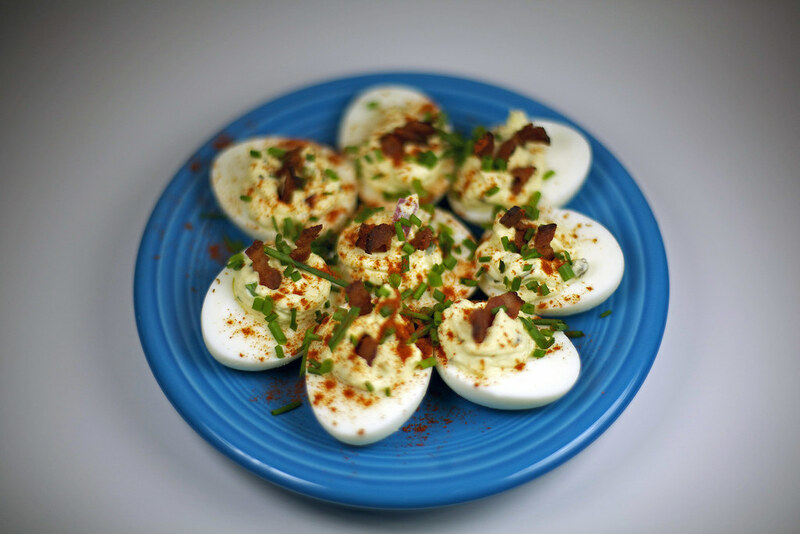 Once eggs are filled, add bacon to each egg, and garnish with extra chives and paprika. Enjoy. 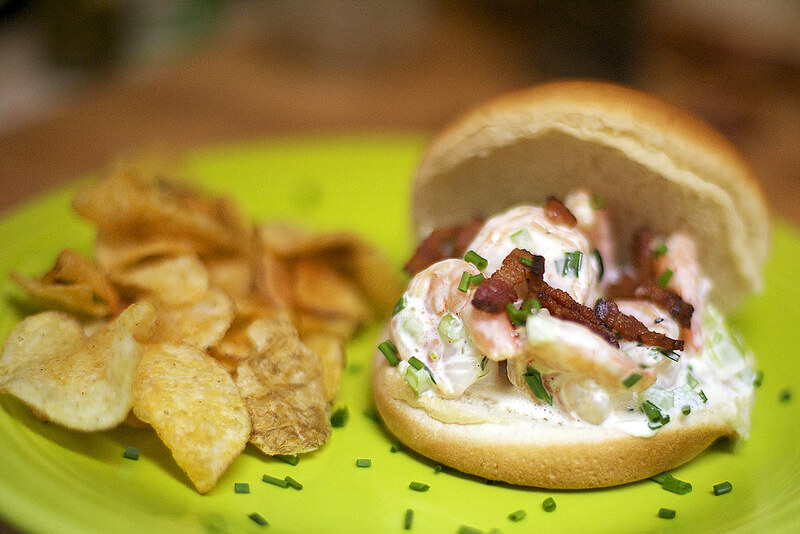 On medium high heat cook shrimp using reserved bacon fat from cooked bacon seasoning with salt & pepper. Towards the end of cooking shrimp squeeze 1/2 lime, when done remove from pan and cool in refrigerator until cool. In a large bowl combine remaining lime juice & zest, mayonnaise, mustard, vinegar, pepper, Cajun seasoning, celery salt, and sea salt and whisk together. Add shrimp and coat with wet ingredients, then stir in chives, onion, capers and celery. Serve chilled with crispy bacon, and chives or chopped green onion. Buns are optional. Enjoy! In mason jar or tall glass combine vodka, Worcestershire sauce, horseradish, lime juice, Tabasco, okra and juice, pepper, and salt. Top glass with ice and tomato juice and stir. 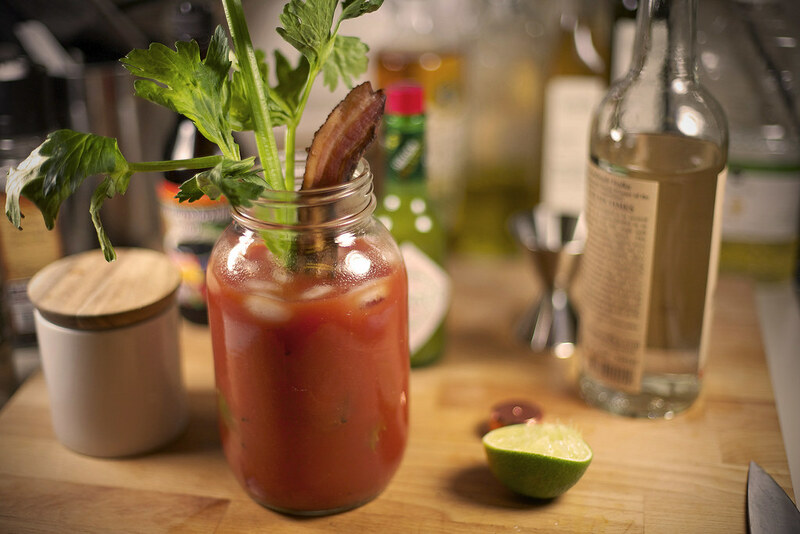 Garnish with Bacon and Celery Stalk. Enjoy! In a rocks glass combine orange slice, lime wedge, bitters, simple syrup and bourbon. 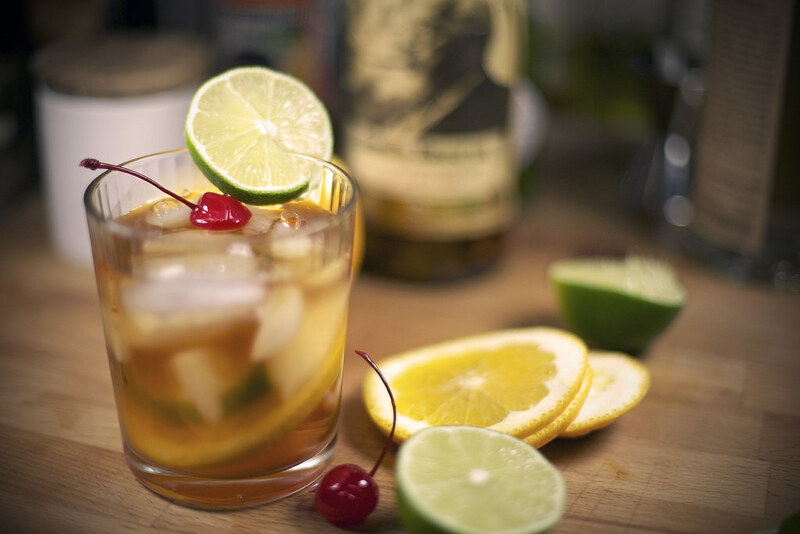 Top with crushed ice, stir and garnish with a cherry. Enjoy! Looks delicious. I’m gonna try them them. Thanks. Very nice. You have impeccable taste in bourbon. It’s the finer things in life that make it worth living…Bourbon is very fine thing.